Brecon Rotary intends to be very open-minded about the types of activities it will support so long as the project or programme responds to a community need in or within the catchment area of Brecon Rotary Club and meets its criteria on the giving of grants. What the club will need to understand is exactly what the money will be used for, who will benefit from it and how much difference it will make. The Powys War Memorials Project is a four year project, mainly funded by the Heritage Lottery Fund (HLF), to commemorate the centenary of World War 1. The project can provide grants up to £5,000 for World War 1 memorials in Powys to be repaired, restored or maintained. The grants can cover up to 90% of the total cost of the work. The outstanding 10% needs to come from match funding, e.g. from a Town or Community Council. Any type of World War 1 memorial in Powys is eligible, including stone obelisks or crosses, stained glass windows, wooden boards or plaques, statues or paper rolls of honour. The grants are being allocated on a first-come, first-served basis. Therefore, it is advisable to apply sooner rather than later. The Code of Fundraising Practice and its associated Rulebooks for Street, Door and Private Site Fundraising outline the standards expected of all charitable fundraising organisations across the UK. The standards were developed by the fundraising community through the work of the Institute of Fundraising (IoF) and Public Fundraising Association (PFRA). The Code and the rule books were formally transferred to the Fundraising Regulator at its launch on 7th July 2016. Recommendations on changes to the Code are made by the Fundraising Regulator’s Standards Committee in consultation with fundraising stakeholders. Decisions to change the code are subject to approval by the Fundraising Regulator’s Board. In October 2017 an ‘Introduction to the Code of Fundraising Practice’ webinar was recorded by the Institute of Fundraising and delivered by the Fundraising Regulator. This can be viewed here. The Foundation also supports young carers, as well as disabled and terminally ill young people. The Foundation's primary aim is to support small charities which can demonstrate achievement in persuading and deterring at-risk young people from proceeding further down the pathway to custody. Much of the Foundation’s grant-making policy is directed towards enabling development and change. A secondary aim is to assist small charities helping with disabled and terminally ill young people through funding for specialist equipment and organised respite breaks. The maximum grant available is typically £5,000, The average grant is £3,000. During the year ending 31 March 2017 the Foundation awarded 310 grants (2016 – 320 grants) to charities totalling £821,980 (2016 - £847,705). Approximately 1 in 3 requests for grant support are approved. A list of all major awards made during the year are available on pages 15 and 16 of the Foundation’s annual accounts. An application form can be downloaded from the Foundation's website. Organisations must be working in the UK, the Isle of Man or the Channel Islands, combating disadvantage and making a demonstrable difference to children and young people's lives. Priority will be given to projects where a relatively small amount of money can make a big difference. Grants of up to £10,000 per year for up to 3 years are available. There is no requirement for match funding. During the year ending 30 June 2016, Children in Need allocated Small Grants totalling £6,900,000 to 1,342 projects. £700,000 was awarded to 82 projects in the South West of England (see page 13 of Children in Need's Annual Report for a year-by-year breakdown). Organisations that are already in receipt of a grant from Children in Need can apply for further funding to keep running the same project or for a different project. Applicants need to be able to provide convincing evidence of the differences the grant has made to the lives of the disadvantaged children and young people the organisation has worked with. 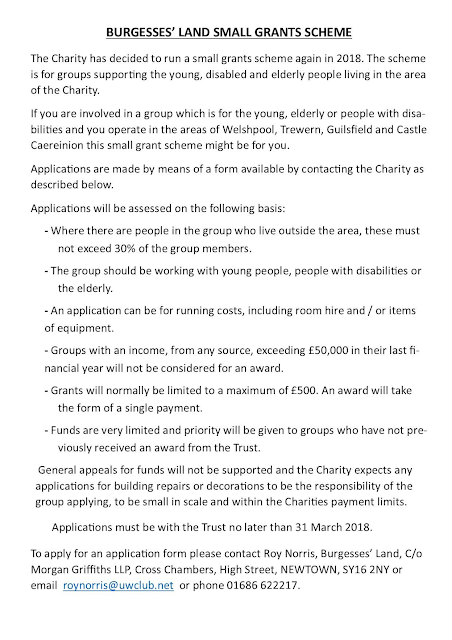 Organisations who currently hold an award from the Children in Need Main Grant Scheme can apply for a Small Grant as long as it is for work with a different group of children and young people. o Organisational overheads or running costs which the organisation would incur whether the project was running or not. However, consideration will be given to funding support costs incurred as a direct result of running the project. Applicants are required to refer to the A-Z guidance when making an application. Further information, including an application form, is available on the Children in Need website. The Thomas Wall Trust, which has its origins in Wall’s sausages and meat pies and Wall’s ice-cream (introduced to protect workers because sales of meat products declined during the summer), has introduced a new website and online application process. 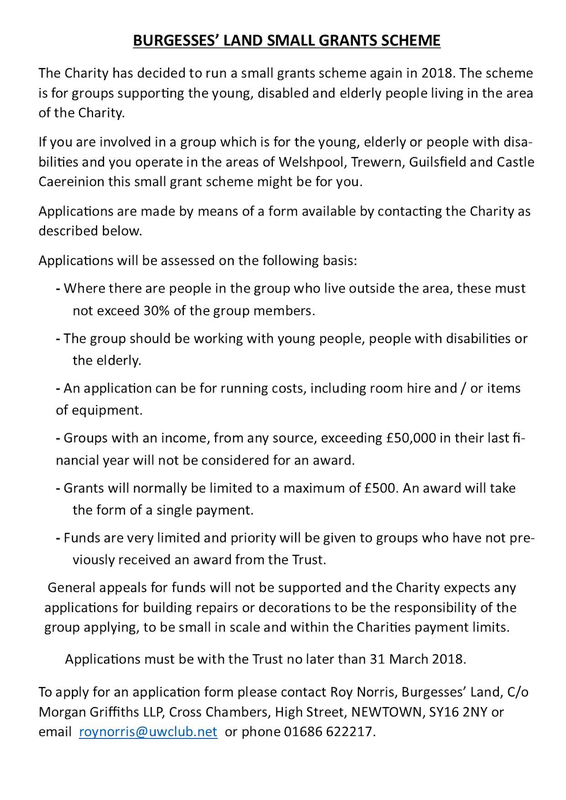 The Thomas Wall Trust awards grants up to £1,000 to smaller UK charities that are actively responding to the educational and social needs of their communities. The Trust is particularly keen on supporting projects that are innovative in some way. Grant awards are specifically for project costs. The Trust awards grants to approximately 30 organisations each year. Applicants can apply for a maximum of three grants over three years totalling £3,000. During the year ending 31 July 2017, the Trust awarded 30 grants (2016: 31) to charitable organisations, totalling £28,987 (2016: £29,169). PLEASE NOTE: UK registered charities applying to the Trust must have an annual income of less than £100,000. In addition to its donations to charitable organisations, the Trust made 60 (2016: 47) awards to individuals, totalling £37,632 (2016: £35,899). Grants to individuals are normally for training and educational purposes. o Requests from small branches of larger charities, if the small branch does not have its own independent set of accounts. The Trust meets twice a year, in July and November. Applications for the July meeting must be received by the end of May and for the November meeting by the end of September. The next deadline is therefore Thursday 31 May 2018. Applicants are required to register on the Trust's new website to be able to access the application form. O dan Gynllun Grant Canmlwyddiant y Bleidlais i Fenywod, byddwn yn darparu grantiau o rhwng £500 a £20,000 i sefydliadau trydydd sector, sefydliadau cymunedol a grwpiau cymunedol, ar gyfer prosiectau a/neu ddigwyddiadau a fydd yn nodi’r canmlwyddiant. Under the Women’s Suffrage Centenary Grant Scheme, we will provide grants of between £500 and £20,000 to third sector organisations, community organisations and community groups, for projects and/or events which will mark the 100th anniversary. Wrth adael Llywodraeth Cymru sganiwyd y neges yma am bob feirws. Mae’n bosibl y bydd gohebiaeth gyda Llywodraeth Cymru yn cael ei logio, ei monitro ac/neu ei chofnodi yn awtomatig am resymau cyfreithiol. Rydym yn croesawu derbyn gohebiaeth yn Gymraeg. Byddwn yn ateb gohebiaeth a dderbynnir yn Gymraeg yn Gymraeg ac ni fydd gohebu yn Gymraeg yn arwain at oedi. On leaving the Welsh Government this email was scanned for all known viruses. Communications with Welsh Government may be automatically logged, monitored and/or recorded for legal purposes. We welcome receiving correspondence in Welsh. Any correspondence received in Welsh will be answered in Welsh and corresponding in Welsh will not lead to a delay in responding.